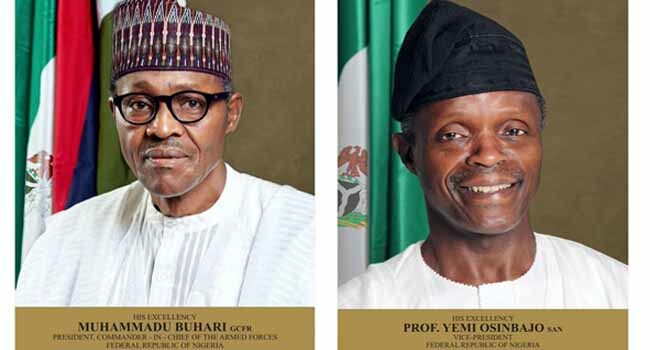 The President of Nigeria, Muhammadu Buhari and Vice President, Professor Yemi Osinbajo, have declared their assets, as required by the Constitution of the Federal Republic of Nigeria. The head of President Buhari’s Media Team, Garba Shehu, gave the hint about the declaration of assets in a statement made available to Channels Television on Saturday. “The Code of Conduct Bureau on Friday acknowledged the submission of President Buhari’s and Vice President Osinbajo’s assets declaration form submitted separately on May 28, and signed for by the organisation’s Chairman, Sam Saba. President Buhari’s Declarant ID was given as: ‘President: 000001/2015′,” the statement read. The figures, as declared, are not yet available. Advocates of declaration of assets say it will put a stop to corrupt practices. After taking the Oath of Office on Friday, President Buhari reiterated his commitment to tackling corruption in Nigeria, but said his government would not be interested in “paying off old scores”.